Have you noticed how many bad chocolate mousses there are around the place? 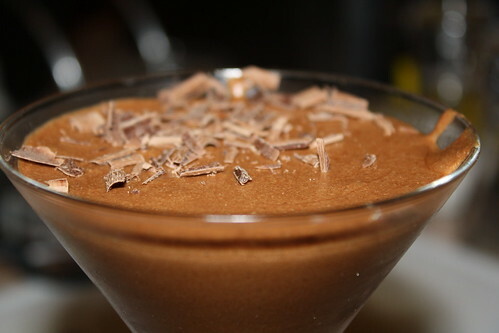 Even if you order mousse in a restaurant it is invariably tough or claggy (or, if you’re really lucky, both) and tastes vaguely of artificial chocolate. This recipe for chocolate mousse is simple AND solves all those problems – all thanks to Julia Child’s vital kitchen manual, the grandly named Mastering the Art of French Cooking. If you’re a keen cook and you don’t yet own this book, I urge you to buy it because it is a brilliant, step by step manual. Even long winded recipes are so clearly spelled out that they are not intimidating. Child’s chocolate mousse recipe isn’t long winded (it took me under an hour to put it all together, and that was with 3 people in the kitchen, including a toddler). As usual, read the recipe a couple of times before starting and have everything ready and it will be painless. I promise. Begin by beating 4 egg yolks with ¾ cup of caster sugar. Do this in a bowl you can set over a pan of just simmering water. Beat well – until the mixture is thick and pale and forms a ribbon which dissolves back into the mixture slowly. If you’re inclined, add a splash of your favourite spirit or liqueur (in our case, ⅛ cup Cognac, but Child suggests ¼ cup of orange liqueur). Now set the bowl over the water and beat until the mixture is foamy and too hot to touch. Child says 3-4 minutes which I found was nowhere NEAR enough time. Then sit the bowl over cold water and beat again until the mixture is cool and forms a ribbon again. It will now be roughly the consistency of mayonnaise. Don’t fret if it’s slightly loose mayonnaise – a lot of mayo that you buy in jars is miles too stiff! You can now relax – the tedious part of the recipe is over and done with. Melt 6 oz (170g) of best quality dark chocolate with 4 tbsp of strong coffee and 6 oz (170g) of unsalted butter. As usual – I did this in the microwave. Allow this to cool a little and then beat the chocolate mixture into the egg and sugar mix. Finally, beat 4 egg whites with a pinch of salt to soft peaks. When starting to form peaks, sprinkling over 1 tbsp of caster sugar and beat until you have stiff peaks. Stir a little of the egg whites into the chocolate mix and then fold in the rest. FOLD. You don’t want to knock out the air because the egg whites are what is going to give the mousse its super light, creamy texture. That’s it! All done. Now you just need to tip the mousse into whatever you’re serving it in. I put a little in a martini glass (for quality control purposes, and the fact that it might take a nice photo) but poured the majority into a large serving bowl. Refrigerate for at least a couple of hours so that the mixture can set. Overnight is perfect. This is the type of dessert where you could be quite happy to just plant your face in it. However, if you have company, serve, passing some fresh cream. Absolutely delicious.